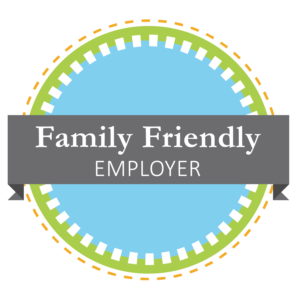 What is a Family Friendly Employer? Family Friendly Employer: Businesses can establish a work environment and policies that enable employees to effectively balance and fulfill both their work and family responsibilities. Providing flexible working arrangements while attending to organizational needs can have strongly positive outcomes for both employers and employees. Higher productivity, reduced absenteeism and turnover, increased job satisfaction, improved organizational effectiveness — these and other benefits can be achieved through family-friendly policies that help individuals achieve a healthy and productive work-life balance. Regardless of size and industry, all organizations can share in the benefits of flexible, family friendly employment policies. Stronger, healthier families contribute to stronger, healthier businesses and empower our community to grow and prosper. Businesses can tailor these and other policies to meet the specific needs of their workplace. It may be that not all family friendly requests can be approved, but engaging in the dialogue and working with employees to establish balance is a useful process. Looking for more ways to support employees and engage them in healthy, family friendly practices? Click here for more resources and ideas. Monterey County needs businesses that support families, both behind the scenes with strong family policies and in the public eye as a service to families. Ready to apply to become a Monterey County Family Friendly Employer? Click here! * Bright Beginnings does not provide legal or HR advice. Please consult an appropriate professional before implementing changes to your HR policy. How to become a Family Friendly Employer?